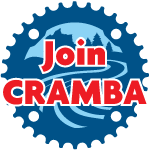 CRAMBA supports groomed snow trails for winter fat biking both by working to groom trails ourselves via volunteer efforts and by working with land managers who are working to produce their own groomed trails. 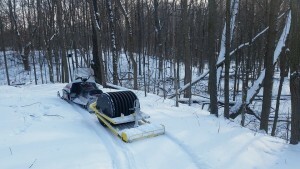 The following trails are groomed either by CRAMBA or the respective land managers. Groomed Snow Bike Route on single track. South Unit: legally open to snowmobiles, groomed for fatbikes. North Unit: groomed for cross-country skiing, snowmobiling is illegal, fatbikes are NOT prohibited, but please respect the other users and not ride when tracks are set. Groomed snow bike route, single track not groomed but open for riding. MTB trails are closed to all biking when snow is present and XC skiing is possible. 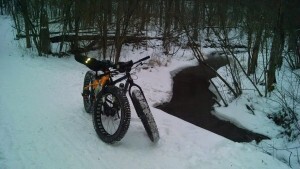 Trolly trails are open for fat biking. Riding a bike specially designed with front and rear tires that are 3.7-4.8 inches wide to float on snow or soft sand. Rims start at 65 mm wide and tires than run on 10 psi or less. No mountain bikes with less than 3.7 inch wide tires will be allowed on trails. They create deep ruts in the groomed surface. Riders need to be aware of the depth of their tire grooves. If the groove is half inch or more, air pressure should be reduced or consider riding another day.